"We all have our demons." What the heck is this? 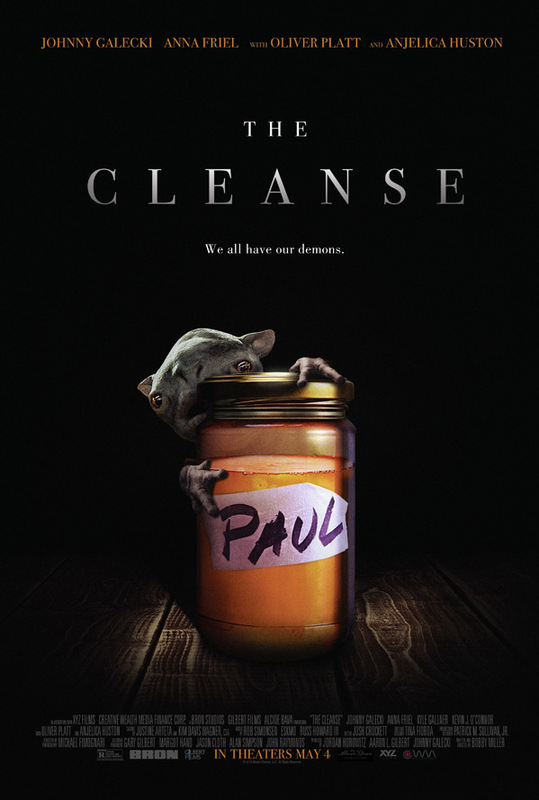 Vertical Entertainment has revealed an official trailer for a very weird indie film titled The Cleanse, formerly known as The Master Cleanse when it first premiered two years ago at the SXSW Film Festival. Described as a "darkly humorous, weird, and soulful fantasy that examines the inner demons in all of us", the film is about a heartbroken man who attends a spiritual retreat, only to discover that the course releases more than toxins and traumatic experiences. Johnny Galecki (from "The Big Bang Theory") stars, with a cast including Anna Friel, Oliver Platt, Kyle Gallner, and Anjelica Huston. I actually really like the concept of this - I'm curious to see how he deals with his ugly "inner demon" and cleans it up. Might be cool? Or maybe not after waiting two years for a release. We'll see. Johnny Galecki (Leonard on "The Big Bang Theory") plays Paul Berger, an unemployed, down and out, heartbroken man searching for happiness. When Paul sees an ad for a spiritual retreat promising to restart your life, he immediately signs up, hoping to cleanse himself and fix his broken life. But after only a few days, he discovers the cleanse is releasing more than just everyday toxins… a lot more. The Cleanse is both written and directed by filmmaker Bobby Miller, making his feature directorial debut after a whole bunch of award-winning short films, including Tub and End Times. This first premiered at the SXSW Film Festival in 2016 under the title The Master Cleanse, and also played at Fantasia and Toronto After Dark that year. Vertical will release Miller's The Cleanse in select theaters + on VOD starting May 4th this summer.